‘’Stranger Things’’ is a Netflix original sci-fi series that graced our screens in the summer of 2016. It is based off a time when classic science fiction tales enthralled audiences with such works such as ‘’Alien’’, ‘’Back to the Future’’, and ‘’E.T.’’, so the show is reminiscent of many classic 80’s movies, doused in nostalgia. The creators of ‘’Stranger Things’’, The Duffer Brothers, clearly know the era, one could say, inside out and upside down, and this shines through. The series follows the curious events in a small Indiana town in 1983 when a 12-year-old boy, Will (Noah Schnapp), goes missing without a trace. Will’s mother, Joyce Byers (Winona Ryder), starts a frenzied investigation into the disappearance, seeking the help of local authorities. At the same time, Will’s friends carry out their own investigation, but instead of their friend, they cross paths with a strange, nameless girl. Soon, mysterious pieces of the puzzle start to become uncovered, mixing supernatural powers and top-secret government workings and cover-ups into the equation. The boys, with the help of their new companion, Eleven (Millie Bobby Brown), discover the existence of the upside down, a dark, alternate version of their small, close-knit town inhabited by a monstrous being, nicknamed The Demogorgon after a ‘’Dungeons and Dragons’’ character. The kids – Mike (Finn Wolfhard), Lucas (Caleb McLaughlin), Dustin (Gaten Matarazoo) with the help of Eleven embark on their own quest to find their missing friend and rescue him from the upside down and the grasp of The Demogorgon. There is a range of characters for the audience fall in love with and feel for as the story progresses. 80’s star’s Winona Ryder’s character, Joyce is a single mother, unable to give up on searching for her youngest son when all odds are seemingly against her. She believes in the impossible as she contacts her son via Christmas lights after a moment of questioning her own sanity. Chief Hopper (David Harbour), although sceptical of Joyce’s far-fetched theories at first, empathises with Joyce, having lost his own daughter, and supports her through her struggles. As for the other adults, they are not much involved in the investigation, seemingly oblivious to the strange circumstances related to the disappearances in the town. Of course, there’s the group of kids that bring the element of unbreakable childhood friendship and bond into the show. 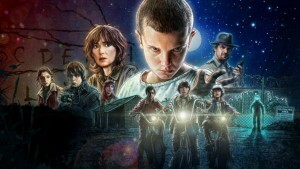 Eleven becomes a part of their club despite the initial mistrust of Dustin and Lucas. The girl is alien to the world of a typical child, having been locked up and experimented on for all her life by the government; however, she learns the power of friendship, love and trust during her time with the trio. ‘’Friends don’t lie’’ – we learn along with Eleven that that is one of the most important parts of friendship. We couldn’t go on without mentioning the teenagers of the show: Nancy Wheeler (Natalia Dyer) is one character that we grow to love, at first coming off as a typical, quite shallow teenager though growing in character as the show progresses and ending up as the biggest badass of them all. Jonathan Byers (Charlie Heaton), a brooding, misunderstood outcast who initially believes his mother has lost her mind from grief. Barb (Shannon Purser), a fan favourite and Nancy’s loyal best friend. Steve (Joe Keery), the typical all-American teenage boy who makes some wrong turns, but somehow manages to redeem himself. The characters are all representations of well-known 80’s movie character tropes, but they don’t seem overly cliché. They add to the nostalgic quirkiness of the show. ‘’Stranger Things’’ is one of the highest-ranking Netflix shows, and rightly so. It is atmospheric, captivating, dark and even frightening sometimes, yet light in some others – like watching a more modern take on a fairy-tale mixed with ‘’X-files’’. The show resembles a full-featured movie, complete with powerful and convincing performances from all actors, beautiful cinematography and special effects, complete with a wonderful 80s soundtrack that features staples of the era such as ‘’Should I Stay or Should I Go’’ by The Clash. This show is a throwback to an era that was popular for its dodgy fashion, classic pop, rock and the many films that define the science fiction genre today. It is greatly influenced by many of the era’s reigning creators such as Spielberg and Stephen King, to name a couple, and manages to bring iconic many 80s elements into one, making ‘’Stranger Things’’ almost like a love letter to the time.